Berkshire Nightlife Activity & Events | INCREDIBLE list of Berkshire County Entertainment. Updated DAILY! BERKSHIRE COUNTY NIGHTLIFE CALENDAR || BARS / PUBS / CLUBS || BERKSHIRE BANDS & MUSICIANS || ADVERTISE HERE!! Please wait while we refresh & reload!! The Berkshires 24-7 on FACEBOOK! One moment, please ... as we direct you to the most current content! OR CLICK HERE if you've waited long enough!! QLC | The HOTTEST Acoustic Duo in the Berkshires! BRIAN BENLIEN + JIM WITHERELL = Great Music, a little comedy & parodies, a whole lot of fun! J Allens Clubhouse Grille: 41 North St, Pittsfield MA 01201 | 9pm - Midnight | NO COVER! To book this dynamic duo to perform at YOUR establishment, contact Jim Witherell on facebook! (8/18) TRIVIA Night w/Bob Heck ... AND! ☼Locally owned family restaurant committed to providing customers with the finest in fresh quality food ...in a relaxed, inviting atmosphere! Thursday Night Karaoke w/LAS Entertainment - Come sing your favorite songs! THE '6 HOUSE PUB: WIlliamstown MA - (Thursdays) Thursday night Karaoke with Lita Williams | 7:30 - 10:30pm! GATEWAYS INN PIANO BAR: 51 WALKER ST, LENOX MA 01240 - LIVE JAZZ MUSIC w/Rob Kelly | 8pm | NO COVER ($15 minimum food/beverage purchase per person in our Piano Bar - excluding dinner and houseguests) | OPEN TO ALL AGES. HOOTENANNY! SIGN Up: 7pm SHOW: 8pm | $3 / $5 - PERFORMERS FREE! (nearby) MOUNT WASHINGTON HOUSE: 2627 State Route 23, HILLSDALE NY 12529 - (THURSDAYS) Singles Pool Tournament | 7pm | $5 to play, double elimination, winner takes all | $25 cash for second place. PURPLE PUB: 65 SPRING ST, WILLIAMSTOWN MA 01267 - no entertainment info available according to venue's facebook page | 8:30pm | NEVER A COVER! Blues and Blues Infused Folk, Gospel, Classic Rock and Funk. Featuring dynamic lead vocalist Gina Coleman! ★ ♫PETE BOYD ... All our favorite tunes - Acoustic Rock, Pop and Country tunes ... Classics thru today, plus original music, too!! Come see what the ruckus is about!! Duffy and Erin Return! Guitars and vocal harmonies ... this duo performs the songs you belt out in the shower (from Journey to Adelle ti the Eagles!) and a few originals, too. Mostly, they just enjoy life and how much music improves it. Acoustic Music you can dance to! Boom Bash @ The Whit - It's the big kickoff event for BOOM (Berkshire Organization for Original Music). Come out and meet your creative and talented neighbors, and show your support for the arts! It's FREE! The party's on us, cause we want to get to know you and win your support! One of many Berkshire artists sharing original music, look for Robin's performance 6:30 - 7:30ish .... Area media, press, dignitaries, members of the business community, everyone... Come learn all about BOOM! The Whitney Center For The Arts: 42 Wendell Ave,Pittsfield MA 01201 | 4 - 9pm | All Ages | FREE! ♫ LIKE Robin O'Herin Blues on Facebook! CROSSROADS CAFE: 195 Onota St, PITTSFIELD MA 01201 - Friday Night Live Entertainment: DJ Friz | 9pm | 21+ w/ID | No Cover!!! GATEWAYS INN PIANO BAR: 51 WALKER ST, LENOX MA 01240 - LIVE MUSIC | 7:30pm | NO COVER ($15 minimum food/beverage purchase per person in our Piano Bar - excluding dinner and houseguests) | OPEN TO ALL AGES. JOHNNY's BEACH CLUB / PEPE's: PITTSFIELD MA 01201 - DJ | TIME: ?? | COVER: ?? PITCHER's MOUND PUB: 218 ASHLAND ST, NORTH ADAMS MA 01247 - MUSIC & DANCING w/DJ JON! - Off the beaten path from downtown North Adams lies this throw back College Bar w/ a Cheers vibe. TAVERN at the VILLAGE INN: 16 CHURCH ST, LENOX MA 01240 - (no info) | NO COVER | 21+ w/ID | time: 9pm ? State Street Tavern: 167 State St, North Adams MA 01247 - Karaoke on Friday Nights | 9pm | ? No Cover ? UNCLE LARRY'S TAVERN: RT 20, BECKET MA 01223 - KARAOKE | 9pm. | NO COVER! DJ, playing a mix of music EVERYONE can dance to! ★★PortSmitt's Lakeway Restaurant - CALL TODAY to book all your upcoming parties and events!! 413-236-5727 | Locally owned family restaurant committed to providing customers with the finest in fresh quality food ...in a relaxed, inviting atmosphere! Live Music: Dan Gingras | 8pm ⎈Locally owned family restaurant committed to providing customers with the finest in fresh quality food ...in a relaxed, inviting atmosphere! Jesse Luke on the piano - Saturday's - next to the fire place. Taking requests covering centuries of music! Kemble Inn / Table 6: 2 Kemble St, Lenox MA 01240 | 6 - 10pm | JOIN US! | Open to ALL!   Ray Mason!! ... Original Pop - Roots & Rawkin' Roll!! In his own words, Ray is "an old guy with a beat up guitar (1965 Silvertone electric) singing and playing songs about heartbreak and furniture” | Come and enjoy the experience! Lonesome Brothers (Jim Armenti, Ray Mason, Keith Levreault) - A beautiful outdoor covered concert - Rain or shine. ➽Backwater Bar & Grille, located on beautiful Queechy Lake in Canaan NY. Relax & dine year round - Just minutes - a short scenic ride - from the Berkshires!! Spectrum Playhouse: 20 Franklin St, LEE MA 01238 | 413-394-5023 - (8/15) 'No One is Alone' Broadway Cabaret | 7:30pm | Tickets: ?? | "A night of musical theater featuring Joe Sicotte and Katelyn Leveille." CROSSROADS CAFE: 195 Onota St, PITTSFIELD MA 01201 - ( ) Live Entertainment: | 9pm | 21+ w/ID | No Cover!!! GATEWAYS INN PIANO BAR: 51 WALKER ST, LENOX MA 01240 - LIVE JAZZ MUSIC | 7:30pm | NO COVER ($15 minimum food/beverage purchase per person in our Piano Bar - excluding dinner and houseguests) | OPEN TO ALL AGES. JOHNNY'S BEACH CLUB: 87 WAHCONAH ST, PITTSFIELD MA 01201 - DJ | 9pm | $5 ? | 21+ w/ID ? THE LION's DEN: 30 MAIN ST, STOCKBRIDGE MA 01262 - (10/24) LIVE ENTERTAINMENT TONIGHT: Woodford Way - acoustic duo performing original music as well as favorites from temptations to Paul Simon | 8pm | NO COVER! SUNDAY AUGUST 21st 2016 - 5/1/2016 SUNDAY AFTERNOON & EVENING Events, Music & Activity in the Berkshires! SPONSOR A BANNER AD LIKE THIS - RATES START AS LOW AS $25 for 30 DAYS!   Ray Mason!! ... Original Pop - Roots & Rawkin' Roll!! LOVE LOVE, Ray Mason Band (8-9:30pm), The Fawns. A great triple bill! In his own words, Ray is "an old guy with a beat up guitar (1965 Silvertone electric) singing and playing songs about heartbreak and furniture | Come and enjoy the experience! WHITNEY CENTER FOR THE ARTS: 42 Wendell Avenue, Pittsfield MA 01201 - (10/25) Town Players of presents a staged reading of "Professor Roth's Will". The playwright, who is also directing this staged reading, is Joe Starzyk who has been writing plays for over 30 years. Since studying playwriting in Oxford, England, he took a 27 year break, and in the last 7 years has written numerous plays. His works have been performed at theaters all around the country, in Europe, and in Mexico. His play, "Wedding Secrets", was named the winner of the McLaren Memorial Playwriting Competition in Midland, Texas, as well as the winner of a Perry Award and 4 STAR awards. And his play, "A Grand Night For Murder" will be featured at NKU's Yes Festival this year. Joe currently lives in Brunswick, NY with his wife, Mary. This is a drama about 4 siblings who gather together for the reading of their father's will. The dysfunctional group gathers on the campus where their emotionally disconnected father was a long-time professor. All the family, and the siblings' personal trials and life long baggage come out as they begin to clean out his office. They realize that their father is still with them as they discover the real cost of being the child of the infamous Raymond H. Roth. The cast includes Mary Daigneault (Mary), Nancy Schaffer (Llanor), Jon Marks (Thomas), Michelle Saunders (Gwen), Joe Starzyk (Edmund), Eric Washburn (Professor Roth) and Leah Marie Parker (Mrs. Roth). | 2pm | Admission: $5. ★REV TOR - LIVE TONIGHT!! (5/1) ★ Rev Tor Solo - Essentially a One-Man Band, Tor uses a looping system to create music that inspires us all! Come experience the experience! Powerful, original indie rock for the masses! CALL ... or check out PORT SMITT'S FACEBOOK PAGE FOR Next week's Entertainment & DINNER SPECIALS! Remember! - Every Friday, enjoy awesome LIVE acoustic music in the tavern starting at 7pm (No Cover!) ... AND Saturdays, Karaoke at 8pm! Ray Mason ... Original Pop - Roots & Rawkin' Roll!! In his own words, Ray is "an old guy with a beat up guitar (1965 Silvertone electric) singing and playing songs about heartbreak and furniture" | Come and enjoy the experience! A beautiful outdoor covered facility. Rain or shine. Hyland Orchard & Brewery, 199 Arnold Road, Sturbridge MA | Free! | Afternoon show: 1-5pm. Rainbow Restaurant: 109 First St, Pittsfield MA 01201 | 413-443-0002 or 413-443-0004 - Sunday Brunch Buffet | 11am - 3pm | 30 craft brews, wood-fired pizza, pasta, and much more. CRYSTAL HARD HAT SALOON: 55 Union St, North Adams Massachusetts MA 01247 - NASCAR AND MUNCHIES!! GOOD TIMES.. We usually have a good size crowd for a Sunday.. Sometimes we do Karaoke too!!!! | time: ?? | GOOD TIMES AND GREAT PEOPLE - WE WELCOME ALL BIKERS!!!!!!!! GATEWAYS INN PIANO BAR: 51 WALKER ST, LENOX MA 01240 - LIVE Jazz MUSIC | 8pm | NO COVER ($15 minimum food/beverage purchase per person in our Piano Bar - excluding dinner and houseguests) | OPEN TO ALL AGES. THE LION's DEN: 30 MAIN ST, STOCKBRIDGE MA 01262 - LIVE MUSIC Nightly: (10/25) Rakish Paddy “Celtic infused, contemporary folk and fun” | 8pm | NO COVER! MISSION BAR & TAPAS: NORTH ST, Pittsfield MA 01201 - "Occasional Sundays - Songwriters Room/ schedule varies" | No Cover | NO DATES, TIME OR INFO GIVEN. MISSION BAR HAS NO TELEPHONE. STAGECOACH TAVERN: 864 S. Undermountain Rd, Sheffield, MA 01257 - LIVE MUSIC on Sundays for your listening pleasure - The musical stylings of Wes Buckley | 4-8pm | For a reservation call 413-229-8585. STARVING ARTIST CAFE & CREPERIE: 40 MAIN ST, LEE MA 01238 | SUNDAY WEEKEND MUSICAL BRUNCH SERIES | 11am - 2pm: Live bluegrass, jazz, funk, classical, and other types of music from talented local performers. | NO COVER, BUT TIPS FOR THE MUSICIANS ARE GREATLY APPRECIATED!! CHECK OUT LIVE & LOCAL BERKSHIRE COUNTY BANDS & MUSICIANS!! BANDS / MUSICIANS: CLICK HERE TO BE ADDED TO OUR SITE! Lightfare Monday (Open at 4pm) - Check our FACEBOOK PAGE for tonight's specials! ✔ ⎈ Locally owned , family restaurant committed to providing customers with the finest in fresh quality food ...in a relaxed, inviting atmosphere! BERKSHIRE SOUTH REGIONAL COMMUNITY CENTER: - FREE COMMUNITY SUPPERS ARE OFFERED EVERY MONDAY EVENING FROM 5 TO 6pm. JOIN THEM FOR A DELICIOUS MEAL PREPARED BY SOME OF THE FINEST CHEFS IN THE BERKSHIRES. GREET YOUR NEIGHBORS OR MEET NEW FRIENDS.THEY ALSO COLLECT NON-PERISHABLE FOOD ITEMS FOR LOCAL FOOD BANKS. THIS EVENT IS FREE TO THE COMMUNITY, HOWEVER DONATIONS ARE GRATEFULLY ACCEPTED. BOGIE's HAS FREE POOL ! | 7pm - CLOSE! - ALSO!! Every Monday Night .... Pool Tournament | 7pm | $5 Entry - Winner Take All!! TRIVIA | 8:30pm | WINNING TEAM: $25 GIFT CERTIFICATE | NO ENTRY FEE!! BEACON CINEMA: NORTH ST, PITTSFIELD MA 01201 - ▸ Check tonight's BEACON Movie Showtimes. Open Mic w/JIM WITHERELL - ALL YOUR FAVORITE TUNES, performed with intense vocals & acoustic excellence! COME CHECK OUT THIS DYNAMIC SHOW! CASEY'S BILLIARDS: 501 DALTON AVE, PITTSFIELD MA 01201 | - $5 Tuesday | TIME: ?? MISSION BAR + TAPAs: 438 NORTH ST, PITTSFIELD MA 01201 - OPEN MIC w/Jordan Franklin | Every Tuesday - 7pm | No Cover. OLDE HERITAGE TAVERN: 12 Housatonic St, Lenox, MA 01240 - Tuesday Night Trivia Challenge! Your ad HERE NEXT WEDNESDAY (^^ SPONSOR BANNER AD ^^) ! No STRINGS - no OBLIGATION (first time advertiser rate only). Be the first to complete & submit this form (CLICK HERE) and claim this ad 100% FREE! Guitars and vocal harmonies ... this duo performs the songs you belt out in the shower (from Journey to the Eagles!) and a few originals, too. Mostly, they just enjoy life and how much music improves it. Come share the spotlight with Mike and Erin at OPEN MIC tonight & every Wednesday! ⎈ Locally owned family restaurant committed to providing customers with the finest in fresh quality food ...in a relaxed, inviting atmosphere! TONIGHT: OPEN MIC, KARAOKE, TRIVIA ... ! Berkshire South Regional Community Center: 15 Crissey RD, Great Barrington MA 01230 - (WEDNESDAYS) Berkshire Sings! | 6:45 - 8:15pm | FREE! | Sing to your heart's content under the guidance of musician and teacher Robert Kelly. No auditions and no charge. Open to new and seasoned singers alike. Songs will include pop, folk, jazz standards and show tunes. Exercises in breathing, relaxation and listening will be incorporated into each session. Opportunities to sing as a soloist, duo or small ensemble will be offered. Everyone is welcome, no prior musical training is necessary. All you need is the desire to sing. Music will be provided. Registration requested. Drop-ins are welcome. Open to ALL, Ages 13 through seniors. CASEY'S BILLIARDS: 501 DALTON AVE, PITTSFIELD MA 01201 | 413-997-2255 - FREE POOL | TIME: ?? FIRST CONGREGATIONAL CHURCH: Lee MA 01238 - COMMUNITY DINNER | Doors open at 5pm; Dinner served at 5:30. Free to all. FRIENDS GRILLE: 117 SEYMOUR ST, PITTSFIELD MA 01201 - Friends Grille Trivia RETURNS | 7 - 9pm | Every week counts....cash prize at end for most points! | Outdoor seating is now open! GYPSY JOYNT: MAIN ST, GREAT BARRINGTON MA 01230 - Wednesday Open Mic | 8pm ? | NO COVER ? THURSDAY MAY 19th 2016 - BERKSHIRE NIGHTLIFE Events, LIVE MUSIC & Entertainment | Berkshires' Night Out!! Wind-Up Fest: Williamstown & North Adams, MA www.wind-up.org | 413-458-9700 - (10/15- 10/18): Wind-Up Fest, the Williamstown Film Festival reimagined, is a nonfiction film and media festival guided by the world’s most compelling creators of documentaries, podcasts, long-form journalism, live performance, and storytelling. Plus, three nights of late-night parties with live music. More info at www.wind-up.org Spanning Williamstown and North Adams, Massachusetts, festival events take place at the '62 Center for Theatre and Dance, MASS MoCA, Images Cinema, Williams College's Goodrich Hall, and the North Adams Elks Lodge #487. Three nights of live music with And the Kids, The Sun Parade, Samuel James, Secret Lover, DJK, Wishbone Zoe, Seratones, and George Langford (Javelin). QUARTER LIFE CRISIS ..... 'QLC' | THE HOTTEST ACOUSTIC DUO in the BERKSHIRES! EAGLE'S HALL: Curran Highway, North Adams MA 01247 - Thursdays ....Open Mic with Brian Flagg | 7pm | COME JOIN THE JAM!!!! CRYSTAL HARD HAT SALOON: 55 Union St, North Adams Massachusetts MA 01247 - KARAOKE | 9pm Thursday nights? GATEWAYS INN PIANO BAR: 51 WALKER ST, LENOX MA 01240 | 413-637-2532 - (6/25) Live Music w/ Rob Kelly & Teresa Broadwell | $15 food/beverage minimum. No cover. | 7:30 - 10:30pm | $15 minimum in the Piano Bar (except for inn and dinner guests). Piano Bar menu available. THE GUTHRIE CENTER: VAN DEUSENVILLE RD, HOUSATONIC MA 01230 - HOOTENANNY! SIGN Up: 7pm; SHOW: 8pm | $3/$5 - PERFORMERS FREE! THE LION's DEN: 30 MAIN ST, STOCKBRIDGE MA 01262 - NIGHTLY ENTERTAINMENT!! (10/15) Tonight: Hardin Burns | 8pm | NO COVER CHARGE!! RED HERRING: 46 Spring St Ste 4, Williamstown, MA 01267 - OPEN MIC w/MIKE WOOD of REBEL ALLIANCE | NO COVER! | 9pm -12am Great selection of libations! | ORIGINAL MUSIC BOTH WELCOMED AND RESPECTED!!! JIM WITHERELL - ALL YOUR FAVORITE TUNES, performed with intense vocals & acoustic excellence! COME CHECK OUT THIS DYNAMIC SHOW! ★CASEY's, PITTSFIELD MA 01201 | 10pm | 21+ w/ID | $5 Cover!!! ★★★TO HAVE YOUR EVENTS LISTED ON THE TOP PORTION OF THE NIGHTLY LISTING, PLEASE SUBMIT ALL DETAILED INFORMATION IN ADVANCE. ★INCLUDE A LINK TO YOUR WEBSITE OR FACEBOOK PAGE. ★LIVE/LOCAL BERKSHIRE COUNTY BANDS/MUSICIANS MAY ALSO SUBMIT A GRAPHIC/IMAGE. ★LISTING EVENTS IS ALWAYS FREE!!! GATEWAYS INN PIANO BAR: 51 WALKER ST, LENOX MA 01240 - (6/26) Tonight's Entertainment: Andy Kelly w/Rob Fisch | 7:30pm | NO COVER ($15 minimum food/beverage purchase per person in our Piano Bar - excluding dinner and houseguests) | OPEN TO ALL AGES. THE LION's DEN: 30 MAIN ST, STOCKBRIDGE MA 01262 - NIGHTLY ENTERTAINMENT (10/16) Roger Salloom Motown, R&B . | 9pm | NO COVER CHARGE!! UNCLE LARRY'S TAVERN: BECKET MA 01223 - KARAOKE | NO COVER! Lanesboro, Pittsfield, Lenox, Stockbridge, Great Barrington, Hinsdale, Adams, North Adams, Dalton & More! Jesse Luke on the piano - - - next to the fire place. Taking requests covering centuries of music! JOIN US! | Open to ALL! Jack Waldheim, LIVE ! - ONE Man Dance Band, performing his own unique style of Americana / Rock-Pop / Alt-Country / Funkoustic / Retro Hip Hop / Rock-a-billy!! ★ Rev Tor, Essentially a One-Man Band, uses a a looping system to create infectious music that inspires us all! ◆ ... ... LIVE MUSIC w/ ♫WYKYD - High Energy, FEMALE FRONTED PARTY BAND | Dance to all your favorite tunes ... with NEW SONGS FOR 2016! Ray Mason ... Original Pop - Roots & Rawkin' Roll!! In his own words, Ray is "an old guy with a beat up guitar (1965 Silvertone electric) singing and playing songs about heartbreak and furniture" | Come and enjoy the experience! Tonight, with the Lonesome Brothers celebrating 30 years together....that's gotta count for something! Jim Armenti, Ray Mason, Keith Levreault, Tom Shea, Bob Grant and Jim Weeks. That's right! It's also Lonesome Brothers drummers night. Current drummer Keith Levreault, Tom Shea and original drummer Bob Grant (up from Florida for one night only!) will be taking turns behind the kit as Jim and Ray offer up a very generous supply of Lonesome Brothers favorites. What more do you want? Get your tickets now! The Parlor Room, 32 Masonic St., Northampton MA | 8pm show | Tickets: $?? GATEWAYS INN PIANO BAR: 51 WALKER ST, LENOX MA 01240 - (6/27) Tonight's Entertainment: Charlie Tokarz, Fran Tokarz and Peter Primamore | 7:30pm | NO COVER ($15 minimum food/beverage purchase per person in our Piano Bar - excluding dinner and houseguests) | OPEN TO ALL AGES. THE LION's DEN: 30 MAIN ST, STOCKBRIDGE MA 01262 - LIVE MUSIC Nightly: (10/17) Diva & the Dirty Boys - 60’s Rock | 8pm | NO COVER! MAY 22nd 2016 - 5/22/2016 | SUNDAY AFTERNOON & EVENING Events, Music & Activity in the Berkshires! ★ Rev Tor Solo - Essentially a One-Man Band, Tor uses a looping system to create music that inspires us all! Come experience the experience! Rainbow Restaurant: 109 First St, Pittsfield MA 01201 | 413-443-0002 or 413-443-0004 - Sunday Brunch Buffet HAPPY MOTHER’S DAY - Serving Mother’s Day Brunch Buffet: 10am - 4pm | Reservations Required | 30 craft brews, wood-fired pizza, pasta, and much more. THE LION's DEN: 30 MAIN ST, STOCKBRIDGE MA 01262 - LIVE MUSIC Nightly | 8pm | NO COVER! MONDAY MAY 23rd 2016 NIGHTLIFE PARTIES, BASHES, CELEBRATIONS!!! Check PortSmitt's FACEBOOK PAGE for their Monday $5 Pasta Night Menu! BOGIE's HAS FREE POOL ! | 7pm - CLOSE! 501 DALTON AVE, PITTSFIELD MA 01201 - $10 Table night!! Bring as many people as you want for 10 bucks. FREE POOL all day & night long! THE LION's DEN: 30 MAIN ST, STOCKBRIDGE MA 01262 - NIGHTLY ENTERTAINMENT!! (6/15) LIVE MUSIC: Christopher John - Old and new favorites | 8pm | NO COVER CHARGE!! 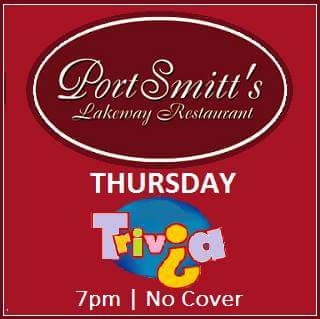 TONIGHT'S NIGHTLIFE IS SPONSORED BY: Port Smitt's Lakeway Restaurant: * 413-236-5727 | | Warm, friendly atmosphere, full bar & live weekly entertainment - Watch for Port Smitt's 2 for $25 Dinner Specials. JIM WITHERELL Acoustic Solo hosts Open Mic! COME CHECK OUT THIS DYNAMIC SHOW! | 7pm | NEVER A COVER CHARGE. Berkshire South Regional Community Center: 15 Crissey RD, Great Barrington MA 01230 - (TUESDAYS) Berkshire Ukulele Band | 6:30 - 8pm | FREE! | Multi-instrumentalist, teacher and performer Rob Sanzone teaches ukulele technique, chord progressions and songs from many musical genres. A limited number of ukuleles will be available for loan to participants who do not have an instrument. Beginners are encouraged! Reading music is not required. Music and chord charts will be provided. Registration requested. Drop-ins are welcome. Open to ALL, Ages 13 through seniors. Sponsored by Bobbie Hallig and Jenny and Adam Hersch..
CROSSROADS CAFE: Pittsfield, MA 01201 - FREE POOL all day & night long! PURPLE PUB: 65 SPRING ST, WILLIAMSTOWN MA 01267 - Open Mic w/Patrick Gray Jr | 8pm | NEVER A COVER! HOLDING YOUR CURSOR OVER AN IMAGE ABOVE WILL PAUSE THE ROTATION. Guitars and vocal harmonies ... this duo performs the songs you belt out in the shower (from Journey to the Eagles!) and a few originals, too. Come share the spotlight with Mike and Erin at OPEN MIC tonight & every Wednesday! ✔ Locally owned family restaurant committed to providing customers with the finest in fresh quality food ...in a relaxed, inviting atmosphere! Karaoke w/LAS Entertainment - Come sing your favorite songs! TOMORROW NIGHT! TAVERN at the Village Inn IN LENOX! PURPLE PUB: 65 SPRING ST, WILLIAMSTOWN MA 01267 - TRIVIA w/BRIAN FLAGG - EVERY WEDNESDAY | 7pm | NEVER A COVER! ★SUPPORT LIVE & LOCAL THEATRE!! Berkshire South Regional Community Center: 15 Crissey RD, Great Barrington MA 01230 - (WEDNESDAYS) Berkshire Sings! | 6:45 – 8:15pm | FREE! | Sing to your heart’s content under the guidance of musician and teacher Robert Kelly. No auditions and no charge. Open to new and seasoned singers alike. Songs will include pop, folk, jazz standards and show tunes. Exercises in breathing, relaxation and listening will be incorporated into each session. Opportunities to sing as a soloist, duo or small ensemble will be offered. Everyone is welcome, no prior musical training is necessary. All you need is the desire to sing. Music will be provided. Registration requested. Drop-ins are welcome. Open to ALL, Ages 13 through seniors. Community Dinner | Doors open at 5pm; Dinner served at 5:30. Free to all. LILAC PARK: LENOX MA 01240 (7/1) Whiskey City - 6pm outdoor concert in the park! DCSC - May 26 In short, Emily Danger is: Pretty music about ugly things. Dark cabaret rock from Brooklyn. Unique, beautiful music, with lyrics proclaiming her message of feminism and artistic activism. Danger has been a staple of the New York music scene with her astounding live show featuring a host of electronics, psychedelic projections, and Danger’s signature four octave range. 2016 LIVE ON THE LAKE SUMMER LAKESIDE CONCERT SERIES: BURBANK PARK, ONOTA LAKE, PITTSFIELD MA 01201 | 6pm | FREE FAMILY FRIENDLY EVENT - BRING A CHAIR OR BLANKET AND ENJOY THE FREE CONCERT! LEASHED DOGS ALLOWED. PARKING AVAILABLE AT TACONIC HIGH SCHOOL WITH A FREE SHUTTLE TO THE LAKE. BRING YOUR OWN PICNIC, OR VENDORS ON SITE. Classic Rock, Featuring Diane Wieland, Dave Bacon & Dana Welts. Iron Horse Music Hall, 20 Center St., Northampton, MA | ?? pm | Tickets on sale now! DCSC - July 16 GoldenOak Folk-rock trio of friends from the Maine hills. With LIVE MUSIC with ♫ BLACKWATER BAND (HARD-DRIVEN ROCK .... SOUTHERN ROCK ... CLASSIC ROCK, ROCKIN' COUNTRY ... AND MORE ROCK!! Dance to your favorite hits >>> Classic Rock, Pop, Country Rock, Southern Rock. ★JOE GORMAN - SOLO (7/28) ◆ ... ... LIVE MUSIC w/ JOE GORMAN ... Solo | (Capital District musician) - performing 1960s folk music and British invasion classics! DeFazio's Italian Bistro & Bar: 139 Ashland St, North Adams MA 01247 - (Venue has closed it's doors | 3/19/15) NEW NAME & OWNERSHIP: TJ's Southwestern Bar & Grill. ◆ ... ... LIVE MUSIC w/ Live Music with ♫WYKYD - High Energy, FEMALE FRONTED PARTY BAND | Dance to all your favorite tunes ... with NEW SONGS to keep you on your feet all night long! ♫ROBIN O'HERIN (Masterpiece Blues & Gospel) ... along with Stefanie Weber, lays down the backbeat in this unique event. Special guest Andy Taylor on harmonica. Tap & Blues | 6pm Buffet Dinner ($17 adults / $9 children) | Reservations must be made by August 12, cash or check only | 7:30pm FREE concert! Thanks to a Cultural Council Grant. | Call for reservations or info: 413-269-4400 | This concert was made possible in part by a grant from the Otis LCC. Two hours of the delightful folky, funky chick rock duo: Divinitress!!! Pittsfield Farmers Market: First St. (across from the Common), PITTSFIELD MA 01201 | 11am - 2pm | All Ages | FREE!! ★REV TOR - LIVE TONIGHT!! (past event) ★ Rev Tor Solo - Essentially a One-Man Band, Tor uses a looping system to create infectious music that inspires us all! Potsy's First Appearance at this venue. Enjoy all the tunes we love to remember - on the Huge outside (covered) patio! My Place & CO. Schodack: 1640 Columbia Turnpike, Schodack NY (Rte 20) | 6-9pm | Cover: ?? ♫ BREZIEEASTMAN BAND - Paul Oleskiewicz & Joel Sartori ... Two Friends of 35 years playing tunes that keep your feet tapping ... Acoustic Classic Rock & Top 40 from the Animals to Zepplin!! ♫ROBIN O'HERIN | Masterpiece Blues & Gospel - LIVE Tonight! Sanctuary Concerts Presents The Brothers McClurg with Opening Act: Robin O'Herin!! ★REV TOR - LIVE TONIGHT!! (6/18) ★ Rev Tor Solo - Essentially a One-Man Band, Tor uses a looping system to create infectious music that inspires us all! Tonight, Rev Tor joins the Picky Bastards! MATT CAHILL (formally of Berkshire County cover bands Static and Uptrodden) performs our favorite songs by: Pearl Jam, Soundgarden, Alice in Chains, John Mayer, Muse, James Taylor, Blues Traveler and many more... PLUS! Wonderful Matt Cahill original music, too! Christiansen's Tavern at Jiminy Peak Mountain Resort: 37 Corey Rd, Hancock MA 01237 - Live Music ends in March. See ya next year! Cameron Collins solo acoustic show! J Allens Clubhouse Grille: 41 North St, Pittsfield MA 01201 | 8 - 11pm | NO COVER!! Old time Americana roots musicians raise a roots ruckus on fiddle, banjo, guitar and harmonica - Featuring spine-tingling vocal harmonies, spirited banjo/fiddle breakdowns, hillbilly blues, jugband stompers and ballads, with some flatfoot dancing to boot. Ray Mason ... Original Pop - Roots & Rawkin' Roll!! In his own words, Ray is "an old guy with a beat up guitar (1965 Silvertone electric) singing and playing songs about heartbreak and furniture" | Celebrate Holyoke Extravaganza Fundraiser and Preview. An evening of entertainment, refreshments, music and more in support of Celebrate Holyoke 2016 - Come and enjoy the experience! COME IN FOR SOME TASTY GRUB AND REFRESHING GROG!! Mill Town Tavern ... bringing good food and fun to Dalton since 2005! RAKISH PADDY, Berkshires' Favorite Little Celtic Pub Band, LIVE tonight - in Springfield! Wednesday Night Karaoke w/LAS Entertainment - Come sing your favorite songs! After Ours - inspired by passion and romance - is Mark Parsons and Bonnie Senecal performing (acoustically) a variety of music ... blending originals with their own take on current and classic songs. | Come on by and check out this enchanting duo - tonight! Ron Ramsay & Samantha Talora in Concert | No One is Alone" a cabaret staring starring Joseph Sicotte and Katelyn Leveille with Ron Ramsay on Piano at MA. Saturday May 23rd at 7:30 PM Join us a we explore all kinds of relationships through theatrical music! Refreshments available after the peformance. TONIGHT - COME IN FOR SOME TASTY GRUB AND REFRESHING GROG! Tonight & every Wednesday ... hosted by DJ Respect (& special guest Eric Thomas from the bands Shyne & Cover Me). Everyone is welcome - Come play or sing!! Also, best performance (judged by DJ Resect & the audience applause) will win $50! To enter into this contest, you must contact DJ Respect sometime before 2pm Wednesday. CHECK MILL TOWN'S FACEBOOK PAGE for tonight's specials! Bringing great food & fun to Dalton since 2005! IS LOOKING FOR A NEW VENUE!! Jam with Jim! Share the stage with some of the area's finest talent - show everyone what you got! Or just sit back and enjoy an ALWAYS awesome show! ALL YOUR FAVORITE TUNES, performed with intense vocals & acoustic excellence! COME CHECK OUT THIS DYNAMIC SHOW! Masonic Temple: 116 South St, Pittsfield MA 01201 - (PAST EVENT) Town Players of Pittsfield Announces Musical Review on May 1, 2 and 3rd. "Whatever Floats Your Boat", (A Musical Maritime Melodrama), will be directed by Beverly Krol with musical accompaniment by Bob Shepherd. Tickets: $18. (please call 413-443-9279). | Sunday matinee: 2pm. ♫RUMOURS - Rawkin' Female Fronted CLASSIC ROCK BAND - you won't sit down all night!!. If you haven't heard RUMOURS - Now's your chance! UNCLE LARRY'S TAVERN: RT 20, BECKET MA 01223 | 9pm | $ ?? Race Brook Lodge: 864 South Undermountain Rd / Rt 41, Sheffield MA 01257 - (past event) Swing Night in the Barn. Dance the night away to the sultry tunes of Jonathan Suters, Bobby McVeety, and Charlie Tokarz. | 7:30pm: beginner lesson; 9pm: band. | Cash bar (beer & spirits) | $10 cover. Sorry, this event has been postponed ... stay tuned for new date and time!  The Zarvis Allen Band is back together for a special night of music and dancing!! Bringing back tunes by Steely Dan, Stevie Wonder, Earth, Wind & Fire, Orleans, Average White Band, Jeff Beck, Edgar Winter, The Beatles, The Eagles and more. Like James Brown said, "The one thing that can solve most of our problems is dancing!" Grand Ballroom of the Crowne Plaza: 1 West St, Downtown Pittsfield MA 01201 | 8:30 - 11:30pm | $10 cover. Masonic Temple: 116 South St, Pittsfield MA 01201 - (5/2) Town Players of Pittsfield Announces Musical Review on May 1, 2 and 3rd. "Whatever Floats Your Boat", (A Musical Maritime Melodrama), will be directed by Beverly Krol with musical accompaniment by Bob Shepherd. A special reception on THIS EVENING at 5:30pm, preceding the show. The cast are all local singers and musicians, including a youth ensemble. A donation of $40 per person will include the Saturday evening reception and show. Tickets: $18. (please call 413-443-9279). Shows on Friday and Saturday night: 7:30pm | Sunday matinee: 2pm. ★SNAKEHOUSE - LIVE TONIGHT! (5/2) - Berkshire's premier Southern Rock cover band - come dance! ZEN'S PUB, TYLER ST, PITTSFIELD MA 01201 - Karaoke DJ | No time | Cover: ?? Spectrum Playhouse Open Mic is Back - Hosted by ♫ROBIN O'HERIN (Masterpiece Blues & Gospel) - Come on out to share your music and spoken word, meet other musicians, have fun! Open Mic Nights with Robin O'Herin | $2 / free for all performers | Snacks and beverages available for purchase. This series has been made possible in part by a grant from the Lee Cultural Council. Colour 9 will be performing their KILLER MUSIC - LIVE ... at a fundraiser for the Monument Square Playground Renovation. Frank R. Stiles North Adams American Legion Post 125: 91 American Legion Dr , N Adams MA | 7 - 11pm | $10 | Come Dance So Kids Can Play!! Gedney Underground: 34 Hartseville/New Marlborough Rd, New Marlborough MA | 8 - 11pm | Cover: ?? Head SOUTH and check 'em OUT! LIVE POP/ROCK MUSIC (past event) ... What to do on a Wednesday?! HERE's an IDEA .... Sandy McKnight & the Idea, that is! Sandy McKnight & the Idea - the most meaningful funfilled music you've never heard! HOTT New Cover Band out of Western MA - SHYNE!! ★Multi-genre dance band, playing the greatest hits from yesterday - thru today! C'mon and get your SHYNE on! WHITNEY CENTER FOR THE ARTS: 42 Wendell Avenue, Pittsfield MA 01201 - (past event) Town Players of Pittsfield will be holding auditions (5 to 6:30pm) for two comedic staged readings, "Chocolate" by Frederick Stroppel and "Wedding Duet" by Lauren Wilson. One depicts a detective investigating the disappearance of a husband and the other is about a newly married couple on their way to crossing the threshold when it all comes to a screeching halt. Needed are two men and two women. Actors will be asked to read from the script. The shorts will be directed by Denise Roller. STOP IN FOR SOME GREAT GRUB AND REFRESHING GROG!! DON'T FORGET! TRVIA on WEDNESDAYS, QLC ACOUSTIC SHOW, LIVE every THURSDAY ... & MORE LIVE MUSIC ON FRIDAY! GATEWAYS INN PIANO BAR: 51 WALKER ST, LENOX MA 01240 | 7:30 - 10:30pm | $15 minimum in the Piano Bar (except for inn and dinner guests). Piano Bar menu available. Bousquet Ski Area / Tamarack Lounge: 101 Dan Fox Drive, Pittsfield MA 01201 - (past event) Live music w/Satellite Shine | 2 -5pm | ?No Cover? MJ TUCKERS: 61 S Main St, Sandisfield, Massachusetts 01255 - (PAST EVENT) Liquid Courage (? Karaoke) | 8pm | COVER: ?? Wahconah Country Club: 20 Orchard Rd, Dalton MA 01226 - | $15 Donation | time: ? The Fly Returns | Music by: Zepplin, Bowie, Artic Monkeys, Sublime, Stones, U2, Beck and MUCH more! Ray Mason (HAYDENVILLE MA ARTIST, PERFORMING POP / ROCK / ROOTS MUSIC) | Great food and beverages - BYOB | Come and enjoy the experience! ♫PHIL N THE VOID - (past event) LIVE | Dance music with emphasis on vocals - and TWO keyboardists! Featuring Phil Grover, Bob Witherall, Jim Stankiewicz, Eddie Warjasz and Tony Gubelman. Covering the Doobie Bros, Toto, Huey Lewis and the like!! Mildly attractive band members!! IT'S GRUMPY CAT'S BIRTHDAY!!! COME OUT AND DANCE AND SAMPLE THE BEST BAR PRICES AROUND!!! Berkshire Community College (Boland Theatre): 1350 West St, Pittsfield Massachusetts 01201 MA 01201 - (past event) Vegas in the Berkshires - Two concerts inspired by the music of Vegas presented by Berkshire Olde Tyme Review held at BCC's Robert, and in support of United Cerebral Palsy of Berkshire County! | 7pm | Tickets: $15 or 2 /$25. Tickets are now available. American Idol contestant, Katherine Winston, is a singer/songwriter from the Lenox, Massachusetts, whose influences range from country to folk, or blues to pop. Grand Ballroom of the Crowne Plaza: 1 West St, Downtown Pittsfield MA 01201 - (first show in 2016/Celebrating 10 years!!) ZipStohr Comedy at the Plaza | [[[[SOLD OUT SHOW]]]] ★It's ZipStohr's 10th Anniversary!! ★Celebrate their first show in 2016 - Three PROFESSIONAL comics- As Seen On TV!! ★ZipStohr's Comedy at the Plaza #26 is Saturday March 21 at 8pm ★TICKETS ARE ON-SALE NOW! HURRY, THE SPRING SHOW ALWAYS SELLS QUICKLY!! ★18+ w/proper ID. ★Absolutely no admittance after 8pm. ★Tickets are still just $25 ! (Buy a table of 10 - pay for only 9 tickets). ★Call ZipStohr at 413-822-2247 to reserve your tickets or buy them online at zipstohr.com ★Partial proceeds from this show benefit The Berkshire Humane Society. LIVE MUSIC w/ ♫PETE BOYD ... A song list of everyone's favorites (classics thru today) ... plus originals, as well! Pete Boyd ... Solo, Acoustic ... AMAZING! Come see what the ruckus is about!! JOIN PETE TOMORROW NIGHT at PORT SMITT'S LAKEWAY RESTAUANT in PITTSFIELD! LIVE BAND TONIGHT: Summit Hill - Classic Rock Dance Band playing fun Classic Rock, Country and Modern Hits that everyone loves to dance to! JIM WITHERELL Acoustic Solo Show - A seasoned and talented local musician, Jim plays all our favorite tunes, performed with incredible vocals & acoustic excellence! COME CHECK OUT THIS DYNAMIC SHOW! Whitney Center for the Arts, in partnership with the Pitts House Concert Series, is proud to present the Boston based country-folk quintet The Novel Ideas ... w/Special Guests Benny Fingers Kohn and setting the stage: the jazz guitar stylings of Nico Wohl. Doors open: 7pm - w/Nico warming things up while you settle in. Main show: 8pm. The Whit provides an intimate "Bistro" atmosphere, with Tapas, Wine, Beer & Champagne for sale. [BUY TICKETS] Check out The Novel Ideas' entry to NPR's Tiny Desk Concert (CLICK HERE). ★DUFFY & ERIN - LIVE TONIGHT! (PAST EVENT) Guitars and vocal harmonies ... this duo performs the songs you belt out in the shower (from Journey to the Eagles!) and a few originals, too. Mostly, they just enjoy life and how much music improves it. Don't miss this live performance tonight! ◆ ... ... LIVE MUSIC w/ ♫PETE BOYD ... ALL YOUR FAVORITE TUNES, CLASSICS THRU TODAY, PLUS PETE BOYD ORIGINALS, AS WELL!! Pete Boyd ... Solo, Acoustic ... AMAZING! Come see what the ruckus is about!! ★This HOTT New Cover Band out of Western MA - SHYNE (multi-genre dance band) plays the greatest hits from yesterday - thru today! C'mon and get your SHYNE on! ★ David Reed, SOLO - LIVE (11/25) ! LIVE BAND: Raw Energy ... 60s 70s 80s 90s ROCK | 9pm | Cover: ? ?